This is a really neat video that I found on Facebook about the history of white-water sports (rafting, kayaking, canoeing) in Garrett County & specifically at Sang Run. The state of Maryland designated the Youghiogheny River a ‘wild’ & ‘scenic’ corridor and unhappy landowners and real estate owners took their frustrations out on the boaters…by shooting at them! Great history piece. The Upper Yough, cutting through one of the few wilderness canyons in the East, is one of the wildest stretches of river in the U.S.: It starts with a mild section and a few warmup rapids, then boaters hit five miles of continuous rapids up to Class V, 20 in all. The river can only be run during releases from the Deep Creek Dam—of which there are about 60 on the published schedule, April through October. The Yough is less of a river than it is a creek. The 10-mile stretch of whitewater is narrow and rocky, and drops anywhere between 50 and 140 feet per minute. Youghiogheny is an Algonquin word that means stream flowing in the wrong direction, and running it takes a lot of fast thinking and reading water on the fly. The major rapids, like Class IV+ Meat Cleaver and National Falls, all have must-make moves, and the whitewater rarely lets up. You’ll likely spend a lot of time in eddys catching your breath. Commercial outfitters run small rafts with just four people in them, because it’s impossible to navigate a bigger boat through the drops and chutes. The Upper Yough releases Friday, Monday, and the first Saturday of the month, through October; if you’re looking for an extra thrill, Pennsylvania State Parks opens up Ohiopyle Falls, just above the lower stretch, for a few weeks every year in late August and early September. For boaters who aren’t up to the Class V section, the Lower Youghiogheny is the most popular Class III run east of the Mississippi. “Bump!” my husband screamed as our raft slammed into a rock. Never mind that the rock wasn’t real. The river wasn’t real, either. This was, however, real white-water rafting. Very real. The four of us paddled left — though not hard enough, apparently. Our raft slammed into the concrete rock in the middle of the man-made river, then bounced off. Undeterred, we continued our way around the one-third-mile loop, a circular channel filled with well-placed obstacles and swirling, frothy water. Then we paddled over to the conveyor belt, rode it up to the top of the hill, slid back into the water — and did it all over again…. About four hours from Cleveland, in the mountains of western Maryland, is a white-water rafting course that draws Olympic athletes in training — as well as families like mine, with young and inexperienced rafters who feel safer trying the sport in a more controlled environment. The course, owned by the nonprofit Adventure Sports Center International, is one of just a handful in the United States, but the number is growing, says Mike Logsdon, acting executive director of the facility. It opened in 2007. The Team River Runner Leadership Conference and Rendezvous began Monday at Garrett College and the Adventure Sports Center International (ASCI). More than 65 wounded warriors are participating in outdoor and indoor learning exercises and activities. This event is one of a number of community service activities coordinated and hosted by ASCI. Team River Runner (TRR), a 501(c)3 non-profit organization, gives active duty service members and veterans an opportunity to find health, healing, and new challenges through whitewater boating and other paddling sports. In this process, paddlers are put through a step-by-step approach in which they learn to control a kayak in a pool, and then they move to ASCI, which provides a controlled environment where they are introduced to whitewater. The participants then move on to rivers, lakes, and oceans, where they gain additional experience and skills. Leadership training is being provided in cooperation with the Continuing Education program at Garrett College. The conference is in its second year. It brings together vets from the TRR chapters around the country to help them with skills to run their chapters, the spokesperson said. The range of offerings includes topics such as the latest developments with adaptive equipment to sessions on how to accomplish local fundraising and recruit volunteers. Monday’s kick-off speaker was Jeannette Rudy Fitzwater, who conducted a seminar on helping the participants identify their work and management styles to aid them in being able to communicate and work productively with staff and volunteers in their chapters. The Rendezvous portion of this week’s event is in its 4th year. It brings back vets who have gone through the rehabilitation and therapy programs at Bethesda Naval and Walter Reed Army hospitals (and what are now combined as Walter Reed National Military Medical Center) and gives them the opportunity to reconnect with one another. They are also encouraged to bring their families. “A great deal of the healing process is with the families, and all too often they are excluded from events to which the vets are invited,” the spokesperson said. Suzanne Nicolas, events coordinator at ASCI, said the support of the local community has been key in making the conference and rendezvous possible. In coordination with the Upper Potomac River Commission (UPRC), the US Army Corp of Engineers (Baltimore District), NewPage, G&S Coal, Precision Rafting, the Savage River State Forest, and Garrett College, the Adventure Sports Center International (ASCI) will again coordinate efforts for another series of Savage River Recreational Whitewater Releases. ASCI has been able to foster a productive working relationship among all involved parties through the organization of paddler parking, shuttle service, put-in and take-out access, release of liability for the stake-holders, and river risk management through the removal of dangerous river debris. The UPRC has scheduled three recreational whitewater releases from Savage River Reservoir for the 2012 season. Those releases, based ultimately on water availability, are for Sundays June 3 and July 1, and for Saturday, September 29th. The river is scheduled to be ready for activity from 9 AM until 3 PM on each of these three dates. According to Scott Shoemaker, UPRC Superintendent, “If it were not for the efforts of ASCI to coordinate all the entities involved with this event, it just wouldn’t happen.” Mike Logsdon, ASCI Acting Executive Director indicated, “This is a perfect example of a win-win-win-. . . . . .-win situation. Boaters are happy, private vendors, like River Riders from Harpers Ferry, Cheat River Outfitters from Albright, WV, Wilderness Voyagers from Ohiopyle, PA, and Precision Rafting from nearby Friendsville are able to offer an extremely rare product to their guests. In addition, the Army Corp of Engineers, NewPage, G&S Coal, Savage River State Forest, Garrett College, and the UPRC, along with ASCI, are able to provide a public service to the taxpayers who ultimately support their services.” All direct expenses related to the shuttle service, registration of private boaters, and the removal of dangerous river debris is paid for from donations received from the boaters. Private boaters who are able to to navigate difficult whitewater (American Whitewater Class III+/IV) are welcome to participate in this infrequent event. Others who are seeking a once-in-a-lifetime experience are encouraged to contact a professional whitewater outfitter, such as Precision Rafting, Upper Yough Expeditions, or Wilderness Voyagers all located in Friendsville, Maryland. For more information, please contact ASCI at 301.387.3250 or any of our local professional whitewater outfitters. MCHENRY — A western Maryland whitewater course is opening for its first season under public ownership. Garrett County officials say the Adventure Sports Center International near McHenry will open Saturday. The county acquired the manmade course in March after the nonprofit developer defaulted on more than $3 million in bank loans. In a bid to boost sales, the county is offering reduced rates to residents of Garrett County. Instead of the regular preseason rate of $45 per person, county residents can ride in inflatable rafts for $25, or just $10 for those who bring their own boats. The course has averaged about 11,000 rafters a year during its first five seasons. That’s far below the 25,000 that operators projected when the course opened in 2007. Adventure Sports Center International To Host All-American Whitewater Fest. 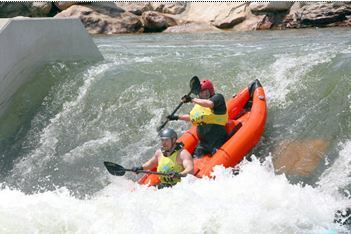 The Adventure Sports Center International will host the All-American Whitewater Festival to celebrate America’s veterans, and kick off the summer season of whitewater rafting and kayaking the weekend of May 28–30. Team River Runner athletes will be guests at the event. This is a wounded warrior organization that teaches injured veterans how to heal through whitewater boating. The festival formally starts on Friday afternoon with Sunset Rafting beginning at 4 p.m. Team River Runner athletes will be on hand during whitewater time from 4 to 8 p.m. kayaking and getting ready for the Veteran’s Race to be held on Saturday. Visitors can meet the veterans and learn how they use whitewater paddling as part of their rehabilitation process, or just come to raft. The Community Day price is $25. An opening ceremony will be held on Saturday at 10:30 a.m. featuring bag-pipes and the JROTC Color Guard. Veteran athletes will then lead the first ever Whitewater Parade at 11 a.m. The parade will also feature the Figurehead Contest, where homemade figureheads are attached to the bow of rafts and floated down the whitewater course during the parade. Figureheads must be submitted no later than 9 a.m. that morning in order to allow time to affix them to a raft. Any person or group can build a figurehead to reflect any historic or famous person or creature, but it must be able to sit in the front of a raft or tied to the bow of the raft. Recommended materials are papier-mâché, fiberglass, wood, found materials, vinyl, or rubber. Prizes will be awarded to the most creative and patriotic figureheads. The Veteran’s Race will be held at 1:30 p.m. on Saturday. Rafts will be captained by Team River Runner athletes, and the public is invited to join a raft team for only $10 per entrant. A guided rafting trip down the mountainside will also be offered Whitewater demonstrations will be held all day Saturday, including Olympic kayaking and Mattress Surfing. Posted on May 14, 2010 Author adminCategories adventure sports center, asci, rafting, whitewaterLeave a comment on Adventure Sports Center International To Host All-American Whitewater Fest. Casey Eichfeld, a 2008 Olympian and National Champion on the U.S. Whitewater Slalom Team, will be telling Olympic stories and signing autographs at ASCI’s “Little Otter Discovery Room” on Saturday, Jan. 16, from 2 to 4 p.m. The Adventure Sports Center’s new mascot, “Asci the Otter” will also be present. Kids are invited to meet Eichfeld, and to play in the Little Otter room for free. Eichfeld is just finishing a winter training camp at Lake Placid in New York, and will be working part time at the Adventure Sports Center International on weekends during the winter. He also works as a raft guide and canoe instructor for ASCI during the summer. Eichfeld grew up Drums, Pa., and has traveled the world racing in whitewater canoes. He began slalom racing at age 5, and by the age of 8, he was on the National Slalom Cadet Team as the youngest competitor ever at a U.S. Whitewater Slalom National Championship. By 2007, Eichfeld had become a stalwart member of the U.S. Junior and Senior National Teams, racing in the double canoe with Ricky Powell. He also continued to race in the single canoe, and won gold in the 2007 Youth Olympic Festival at the Penrith Olympic Whitewater Stadium in Australia. Support the Republican Newspaper! Buy an online membership! Read the rest of the article here.